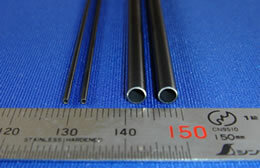 Elliptical pipes can be manufactured as well as round pipes. As for materials, not only Ti, but Ni-Ti, Inconel, hastelloy, Ta, Nb, Au, Ag, Pt and Zr can be utilized. The application of precise pipes is diverse such as for medical, food processing and electronic components. ECM is a metal machining process involving the removal of material from a workpiece by means of electrochemical erosion. This process is achieved by passing a high current electrical charge from the positively charged workpiece through an electrolyte solution to the negatively charged cutting tool. We conduct a straightness test on all of our products, not a sampling test, in every process. Copyright TOKYO TITANIUM Co., Ltd. All rights reserved.